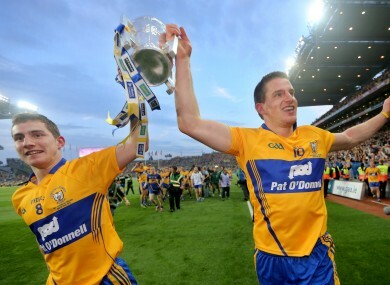 Clare duo Colm Galvin and John Conlon are big injury concerns for the Banner next week. THREE CLARE PLAYERS will face late fitness tests before Sunday’s trip to face Wexford while manager Davy Fitzgerald is already without seven players for the clash at Innovate Wexford Park. Midfielder Colm Galvin is doubtful with a hamstring injury and the attacking duo of John Conlon and Darach Honan both picked up knocks in last Sunday’s win over Offaly. All three started in Clare’s opening day in Ennis and will undergo fitness tests before the Clare team is named after training tonight. Clare are already forced into at least one change as Peter Duggan, who netted against the Faithful, is suspended after being sent-off in that match. Other players out for Clare due to injury are Shane Golden (back) and Cathal Malone (foot). Patrick Donnellan is out for the season with a cruciate injury while Podge Collins and Seadna Morey are not expected back from injury until March while Tony Kelly’s comeback date is pencilled in for April. Email “3 late fitness tests for Clare players and 7 ruled out for trip to face Wexford”. Feedback on “3 late fitness tests for Clare players and 7 ruled out for trip to face Wexford”.